Psoriasis, a chronic skin disease, affects all ages. Red, scaly patches on the body, scalp, elbows, knees are most common. The skin may itch and even be painful; sometimes there are no symptoms. The cause of psoriasis is unknown, although more recent science is pointing to an autoimmune molecular mechanism for this (overactive immune system). There appears to be a complicated genetic predisposition, so it often runs in families. However, up to 40% of all cases don't have any family history. There are many types of psoriasis: plaque psoriasis (the most common type, consisting of a few or many red scaly patches), hand/foot psoriasis, scalp psoriasis, guttate psoriasis (sudden onset of little patches all over the body), pustular psoriasis (when pustules occur in plaques of psoriasis) and severe or all over the body psoriasis, which can be debilitating and even serious. Some of these variations are discussed below. Treatment for psoriasis can be managed with topical medications for milder cases. Light treatments, laser treatments (Xtrac) and oral or injectable drugs may be necessary for more extensive cases. Many new therapies for psoriasis have been advanced in recent years, so there is much hope for successful treatment of psoriasis, which is often called the "heartbreak" of psoriasis. Before and after biologic drugs. 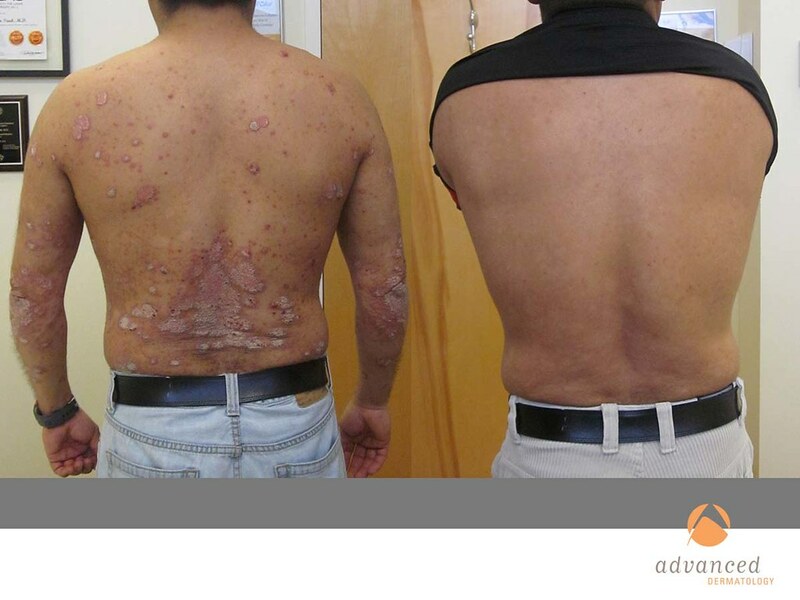 Read more about Psoriasis in our Blog.